Escaping an arranged marriage, 17-year-old Ismae finds sanctuary in the St. Mortain convent, where the sisters worship the gods of old. There, Ismae learns that the God of Death has special plans for her—a destiny that will one day compel her to betray the man she loves. Karou, a seventeen-year-old, lives in Prague and has a few friends at the art school she attends. With her naturally blue hair and gifted drawings of a magical world her classmates don't believe exists, Karou has more secrets than even she knows what to do with. Regularly called on by Brimstone, a creature with a ram's head who runs a curious shop filled with teeth, to complete mysterious tasks requiring her sudden departures, it's not a surprise for others to write off her disappearances. While her best friend, Zuzana might raise an eyebrow to Karou's answers, she doesn't pursue more detail. No one knows that Karou speaks multiple languages and uses magic to travel from Prague to Morocco and other cities within a blink of an eye. Brimstone, almost a father-figure for Karou, regularly reminds her that, while magic may be fun, it always comes with a price. It's only when Akiva comes into her life, a glorious angel who knows much more about her past than she does, that Karou learns just how much of a price it actually is. Her own mysterious past could be even more than she can handle. With love, magic, battles, and loyalty, the creative tale from author Laini Taylor unfolds with style and intrigue. Each and every character was crucial to the story, thoughtful and compelling in their own ways, whether innocent, selfish, or even creepy and malicious. I particularly loved Zuzana, but that could be attributed as well to the incredible narrator bringing her to life. 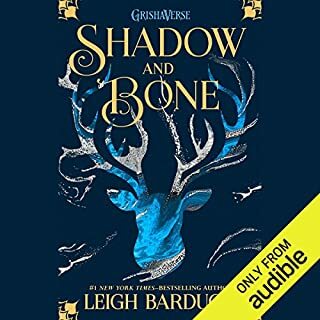 Daughter of Smoke and Bone is an adventure that in its last few pages becomes so incredibly amazing with each event that I was left thoroughly breathless and awestruck at the creative tale. 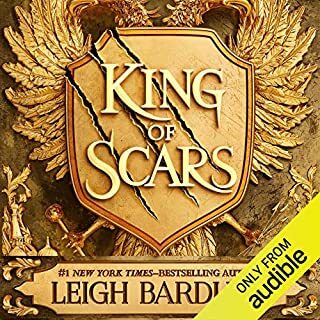 I've said it before and I'll say it again: fantasy stories are just that.much.better in audio. Even more so in this case, as Daughter of Smoke and Bone is read by Khristine Hvam, one of the most talented narrators in town. This was my first time listening to her voice, but I can assure you, it will not be my last. With Hvam in control, every character became so immensely distinct that the story stepped up with its magical moments. My absolute only issue is pretty ridiculous and more than likely to be expected, as I'm well out of my teen years. *sadface* At first, all of the "ooey-gooey-lovey-dovey" stuff was a little over the top, but I had to remind myself I'm not the intended audience. As a general reader who is appreciative of Young Adult fiction, however, the initial first blush of romance was a little more than actually needed. But, no matter. It's simply my own gentle reminder that you should push through it; a little elderly eye-roll every now and again is no big deal when the story ultimately is so incredibly worth it. Khristine Hvam was absolutely wonderful for this story. She clearly felt comfortable voicing each of the characters, easily punching up drama and emotion and love when necessary. What a talent she is! I can't wait to listen to more from her. Blue haired, free spirited Karou runs between worlds to gather special items for her mentor/father figure, Brimstone. He gives her wishes when she completes her tasks and like a spoiled child, frivolously wastes them at times. On one particular errand, she meets someone from her past whom she doesn't yet remember and you travel with her to find out the answers. The writing is fluid, detailed, and rich with character development in this YA novel. The explanation of why Karou collects the items is fascinating. Khristine Hvam is flawless and sounds exactly as I imagine Karou would. What I would change is the characters' flawless beauty. A little imperfection makes the story more plausible and the references to perfection are irritating. Also didn't care for the half animal, fantastical other world and relationships. The book would have been better without it, however the writing is lyrical, lovely, and I recommend this YA romance. 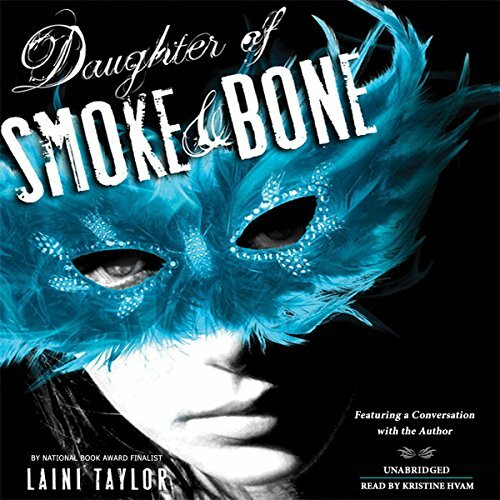 Where does Daughter of Smoke and Bone rank among all the audiobooks you’ve listened to so far? What was one of the most memorable moments of Daughter of Smoke and Bone? When Karou and Akiva see each other again in Marrakesh. It was just so beautifully written. What does Khristine Hvam bring to the story that you wouldn’t experience if you just read the book? I liked the different accents she used for all the characters. I really enjoyed Brimstone and Zuzana the best. "Be careful what you wish for" or "The truth may not set you free"
I'm looking forward to the next book. I usually don't read books that are part of a planned series until at least 2 books are published. (I don't enjoy big cliffhangers) However, if you don't mind the wait then I highly recommend reading this book now. Otherwise, wait until the 2nd book is released. Awesome!!! I didn't want this story to end. The author created a truly unique and very visual world. This is a fast paced fantasy that is filled with action, adventure, heroic girls, dreamy boys and a star-crossed romance. I will highly recommend it. I would have loved the book if I had read it myself, but the narration brought the characters so vividly to life. There was never a false moment or mispronunciation that reminded you there was a narrator and a story, just a fascinating tale where the voices/accents helped to color the image the author created. Can't wait for the next one. A really interesting premise. I read lots of paranormal fantasy and romance and this is new and different. I loved the writing style, the character building and the world building. The world building is stunning. I mean, really. 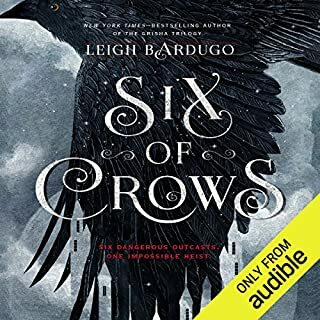 Some of the best world building I've seen this year between the demons, the angels, and the war. The descriptions of the places that Karou sees while she is in "Elsewhere" and also just the whole notion of this other world where demons are reincarnated during battle. There are such intricate details of this world that it feels real. If you like fantasy, you're going to love this book. So epic. The writing in this book is incredible, bar none. Great descriptions, whisking you away in this fantasy tale of star-crossed lovers and a battle as old as time. I could literally see everything playing out right in front of me. I haven't read Ms. Taylor's other work but I've heard great things about Lips Touch: Three Times and if it's anything like Daughter of Smoke and Bone, I'll be raving over it as well. Simply amazing. I was on the edge of my seat and now I'm waiting for more. Side note: I do not like Prague. This is a personal bias against the city because of a bad experience there while I was studying abroad. Going into this book, I was extremely skeptical because it's set in Prague. I have been to the Charles Bridge and some of the other destinations mentioned and you know what? I actually liked this Prague. Seeing the city through Karou's eyes made me actually like Prague. Kudos, Laini Taylor! 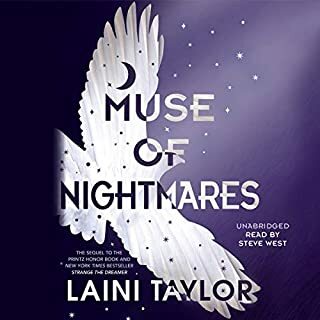 Laini Taylor's worldbuilding is rich within the constraints of the dual framework of an otherworldly, very loosely mythological, paranormal romance and a Romeo and Juliet riff. Her writing is luxuriant and evocative, definitely a cut above for YA. Her characters approach three dimensions at times. The story is compelling when it's not faffing off about hard-bodied angels with satiny shoulders and creamy-skinned blue-haired Mary Sues. This is yet another book that would not exist if not for Twilight, and the 5-star reviews seem to mostly be written by teenage girls who will 5-star anything with a hot boy in it. Daughter of Smoke and Bone is a YA paranormal romance pretending to be a doorway fantasy with angels and demons. 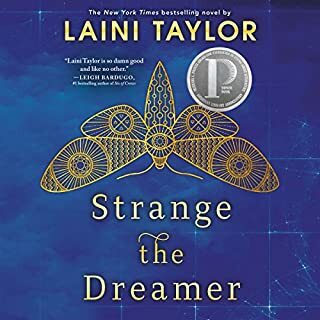 Karou is a preternaturally adept teenager living in Prague, raised by magical beings who hide in an extra-dimensional cubbyhole, who goes on errands around the world, and incidentally picks up tons of languages and skills all over the place. Then an angel shows up and tries to kill her, something like a covert Armageddon goes down, and the rest of book becomes Karou uncovering her secret past while making out with angel-boy. The rest of the book had an almost Narnia tone when it went to Elsewhere and the war between the seraphim and the chimaera. If only the author had capitalized more on these fantasy elements! But the epic war between these races is subsumed by, you guessed it, a pair of star-crossed lovers making kissy-face at masked balls and rolling on grassy hills. I give this book 2.5 stars. The writing is great, the story and the setting are interesting enough to stand up with most fantasy novels. 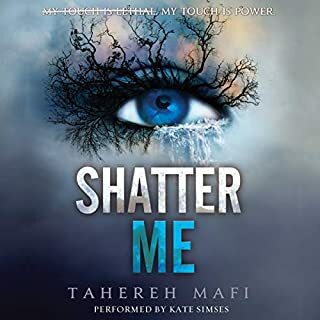 But at its heart, this is just another angsty teen romance with supernatural lovers, and many, many pages are spent dwelling on the physical perfection of the two protagonists and how they make each other feel hot and gooey inside. I recognize that I am not the target audience. I picked this book by chance, and it's not for me. But that said, you can deliver a mature, sophisticated fantasy novel with romance, even for teenagers. This is not that book, though it does come painfully close at times. I could lick this book. The world building is phenomenal and oh so decadent! You will be hooked from the first chapter. Our heroine is smart funny and brave and you will fall in love with her and every other quirky character you meet. The ending is a little rough (for me) BUT I CANT WAIT FOR THE NEXT! I wasn't sure I was going to like this book at first because of the unwanted sexual details of the heroine's misadventure with her disgusting exboyfriend. However, I held on because I had read her amazing "Blackbringer' series and I hoped it would get better. It did not disappoint me! She drew me in and held me captivated by her amazing fantasy world. The angels in this are not your traditional, religious angels. They are something else entirely, a whole different race involved in a war with monsters who aren't really monsters. i can't even fault her with the cliff hanger ending because the book is just that incredibly original and enjoyable.